I’d heard a lot about the dementia friends initiative by the Alzheimer’s Society last year and signed up to find out more… but being busy with setting up a new business and life generally I didn’t follow it up. Then serendipity paid a visit and while taking time out to find creative inspiration at the Chirpy Store in Chapel Allerton I met a Dementia Friend – the store owner Harriet. I’d gone into the shop to look at the shop and their art classes… but I came out of the shop with so much more. Harriet told me about the short training course being run in Chapel Allerton and how they are aiming to make Chapel Allerton truly dementia friendly as a community of shop keepers and as a wider community. She didn’t wince at me saying I was a dementia carer and I felt accepted and understood. For me this made my hidden underground role of being a family dementia caregiver/care manager transform in an instant… no longer something to avoid mentioning socially and became something that was accepted and ‘normal’. Over five years in my family care giving role it has been difficult to connect with others in the same position. If I say I’ve found support in Scotland, London, USA and Canada more than in Leeds – what would you say? I’m really delighted to have the support of online friends around the UK and the world, but it must be time to find some more local pals. Being in my mid 40s , working full-time and being the only family carer for my father has meant connecting with day services and others in the same boat difficult. All those informal connections I’d make if I was older, in a closer community, not working, have just not been possible. So seeing the bright Dementia Friends Badge in the Chirpy Store switched on a light for me. I followed up my conversation with Harriet by going online to the Dementia Friends website and found a session running locally in Chapel Allerton, Leeds the following week. The meeting was at Inkwell, easy to get to and I found a very warm welcome by the 20 or so other people that were there when I arrived. Our group had a memory consultant, OT, builders of carehomes, new and old carers, person with dementia, family and friends, other service professionals… it was an ideal group to get a broad view of what dementia was and how it effected us as a community. The course was run by Gemma from Royal Voluntary Service Leeds and she took us through a light touch informative view of what dementia is and how it effects people in different ways. The initial aim of the Dementia Friends course is to raise awareness and as a result enable people to help each other better in the community… this group seemed to have an extra dimension – “We’ve just found out our relative has a diagnosis of dementia – What do we do? Who can help?” I ended up sharing my insights with people on Carers Leeds, Alzheimer’s Society and digital tools that have helped me in my role. The thing that the services often miss is… their services are not common knowledge and there is no ‘open’ community of help in the city to enable learning and support. I left the meeting thinking… I’d love to keep in touch with these people to help us all work together and make things better. I keep considering the model of NCT (National Childbirth Trust) as a support system for people moving into a new and challenging role and how we could make something like that work for dementia – but it would take more than me to develop it. I used to say…”You can plan holidays, plan education, plan life in many dimensions, but the one thing I really need to plan is my Dad’s future care and it seems far too difficult/impossible.” Maybe Dementia Friends is the beginning of reintroducing community thinking and a way to start supporting people with dementia and their carers as they go through life… and stop it being hidden and over feared. 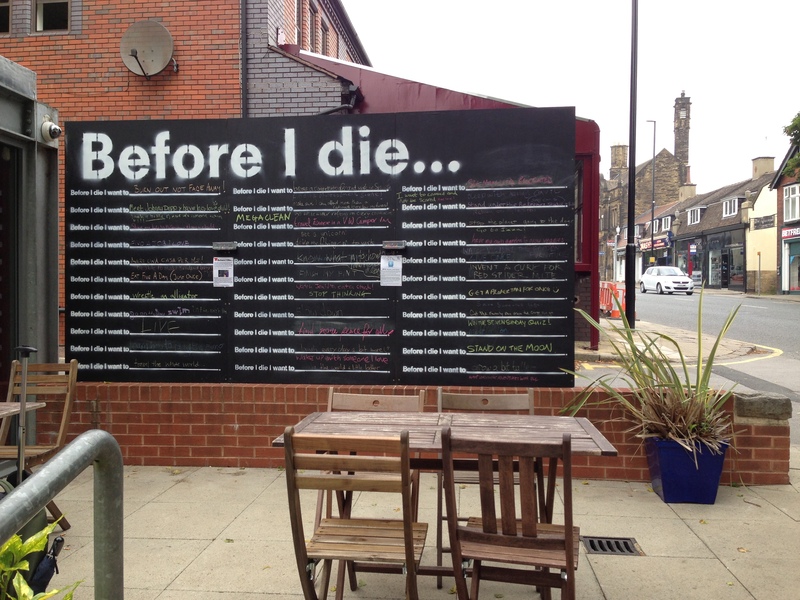 In July 2013 I went to the 7 Arts Bar and found the ‘Before I die…’ wall. 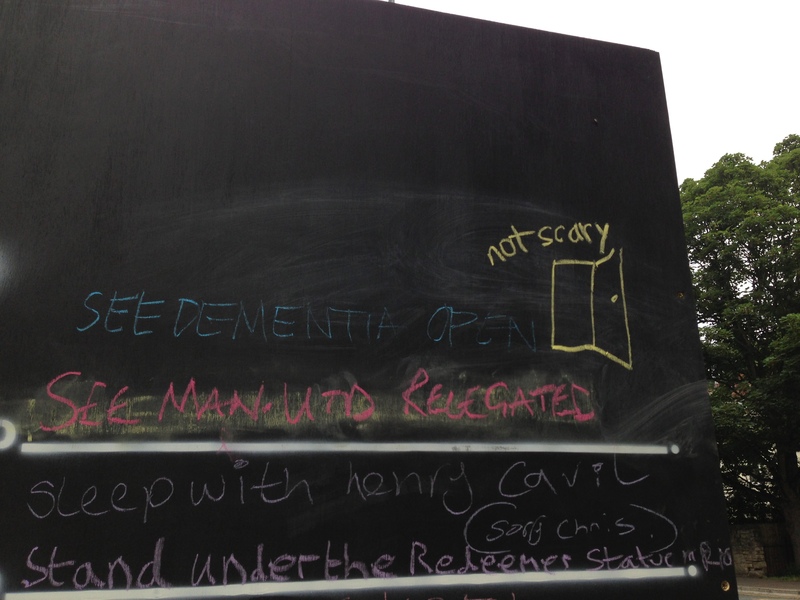 I felt prompted to write this “See Dementia open and not be scary…” this felt like an isolated cry at that point. So I’m delighted to see the Dementia Friends initiative starting to do this. Dementia Friends training is open to all… so if you can make time, go along and help us make Leeds a dementia friendly city for all of us. I was recently invited to speak at the first #mHealthHabitat show and tell event in Leeds. Part of an innovative NHS programme being run in Leeds by Victoria Betton. Along with two other speakers we explored what was happening in health and care in the digital world or in my case how the digital world was helping me in my role as a family caregiver and care manager. 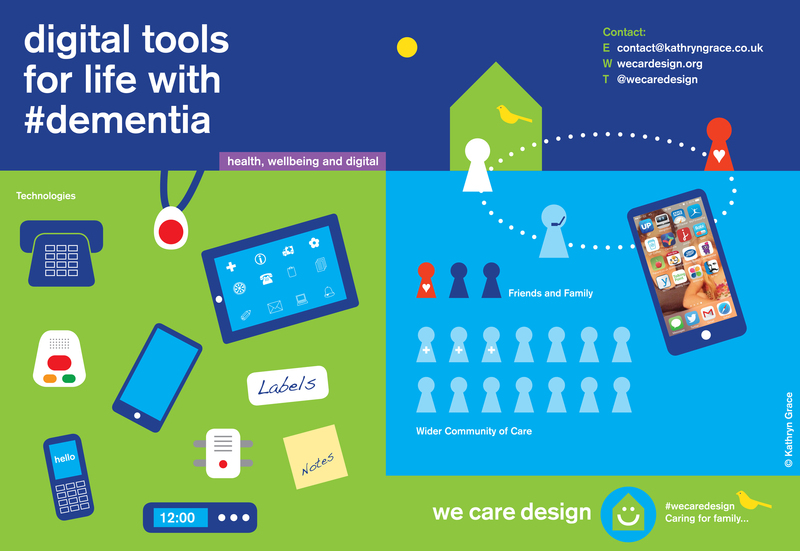 After a year of many informal conversations with people in the health and social care world in Leeds I had the chance to tell the full story of how my family use digital to make caring work and easier. With my story having both a professional and personal dynamic I was tempted to run away after the talk was completed… who am I with all these professionals listening? But something different happened. People really were engaged, had learned and understood my story and were interested to collaborate – the power of story telling vindicated once again. Alicia Ridout awarded me the title of Honorary OT – a high complement indeed from one of the leading health innovators in the city. Over the past five years I have become an underground expert family caregiver and care manager and in combination with my professional digital communication and innovation interests it seems I do have a story to tell that people need to hear. A few months later, I have now been able to use this talk as a starting point for a #mHealthHabitat innovation workshop with dementia service providers in the city. This is opening a wider conversation on both the opportunities for big changes and small changes that will help us move towards our city goal – to make Leeds a dementia friendly city and a great place to be supported as an individual with dementia and as a family caregiver. Most recently I have also re-run this talk and presentation with Volition, Carers Leeds and Leeds Community Foundation to look at further opportunities. If you’d like me to come and share this talk and story with you and your organisation please let me know. Can good lighting really help Alzheimer’s sufferers? What do you think? Good lighting… Yes good lighting is good for all of us, but particularly for people with Alzheimers. Good lighting enables people to orientate themselves, see undulations in their path, read signage and generally help them to achieve tasks. Good lighting helps to avoid shadows that can lead to confusion/anxiety, creates good visual contrast that helps understanding of a space and particularly to avoid falls. Another dimension to light for people with Alzheimers is orientation in terms of knowing and responding to what time of day it is. The winter is a particular challenge when it is dark so long and people with Alzheimers don’t get the easy sunrise/sunset prompts to get up or go to bed everyday and if combined with a visual impairment, they can lose total track of time. This may seem like a small matter, but the confusion that this can cause is quite intense, creating untimely emergencies, depression/wanting to stay in bed, losing sleep, losing healthy sleep pattern that creates exhaustion that stops people coping so well creating more confusion. We have actionable evidence from randomized controlled trials indicating that light can improve outcomes for residents in long-term care. In Alzheimer’s disease the central nervous system begins to breakdown, including a small group of cells in the hypothalamus that keep our circadian rhythms in sync with each other and in sync with the natural light/dark cycle. This is our circadian pacemaker. Light is the prime environmental signal to the pacemaker that re-sets the circadian system each day as the seasons change. Humans evolved over Milena in a natural light/dark pattern that included bright light in the morning and darkness at night. In our modern world we live indoors in relatively dim light, which by itself will not maintain entrainment to the natural light/dark pattern. Most people are OK if they get outside and get a dose of light. However, those in long-term care do not have access to bright light at any time of day, and are often denied darkness at night. The result is circadian disruption. Symptoms include frequent napping during the day, being awake at night, depression and loss of cognitive ability. Solutions include more time out-of-doors (often difficult for those with dementia); or an architectural lighting system that provides light of the required quantity, spectra, duration and timing. 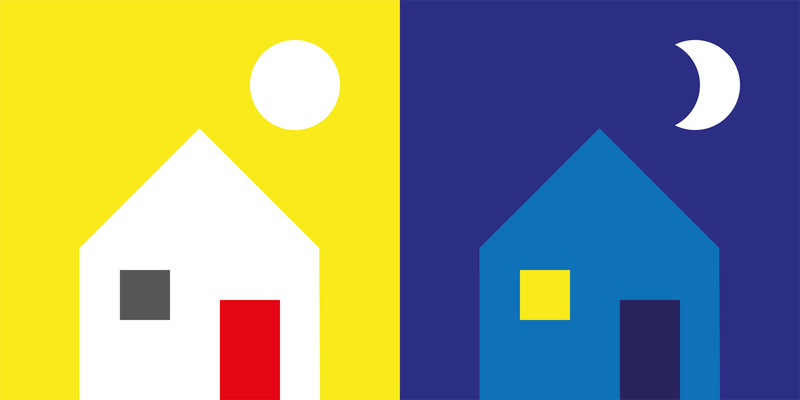 Considered light levels and colours could improve Alzheimer’s care, study shows. 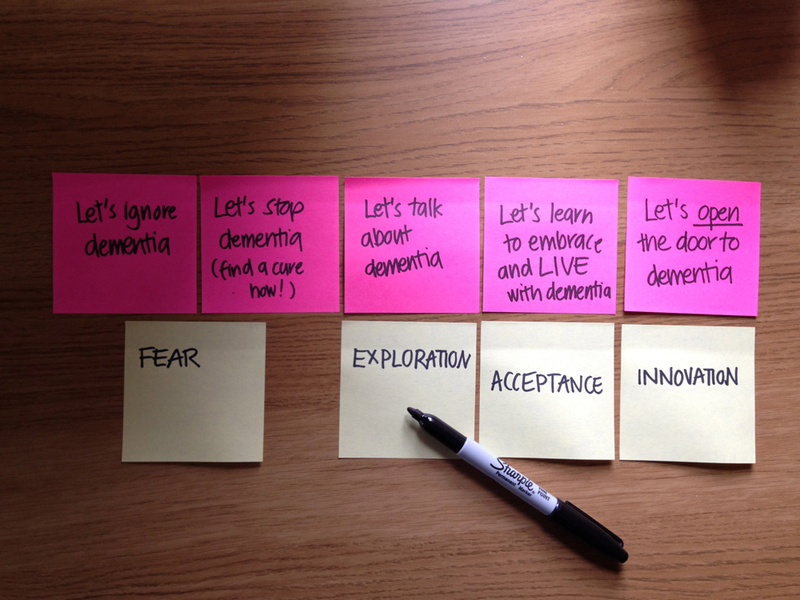 Coming to terms with dementia is not just something that a patient or family carer need to consider. Dementia is a particularly hidden world and the stories that get to the news headlines are the ones that instil fear in us most. I’m so glad that wasn’t the information we saw when Dad got his diagnosis a few years ago. The combination of ‘here’s how to get help on diagnosis’ and ‘how to avoid it’ ie. you’re too late, are highly insensitive and perpetuate the culture of fear that sits around the disease. On reflection and considering my new move into Service Design & Innovation Consultancy I had the following thoughts… it’s just the beginning. I can see that this is a journey for us all… whether it’s a personal or business issue, there’s no doubt it takes courage to embrace and face especially when it includes someone close to you. But if we can all find the courage to move along this journey and services can be developed and become more open and collaborative then we may all benefit. There’s no doubt that there’s a big space for research, but let’s spend time and energy on those services that will help us and our relatives who will not be able to avoid it in coming years. Information coming here soon… things are moving.